Dockless bike-share systems are emerging in cities around the world. But what will be their future impact? Bike sharing systems in busy urban cores are not new. The first major breakthrough started 20 years ago with the so-called “third generation” of bike sharing systems introducing the use of smart cards to unlock and rent bikes. Today, bike sharing is experiencing another breakthrough in the form of dockless systems, where riders can pick up and drop off bikes nearly wherever they’d like using only their smartphones. In just the last three years, dockless bike sharing has expanded from small, campus-scale systems in China to more than 17 million bikes worldwide. In Beijing alone, Mobike CEO Davis Wang estimates 4 million people use the company’s ubiquitous orange bikes daily. The main players, the Chinese companies ofo and Mobike, offer services in more than 200 cities. Dockless bike sharing is clearly becoming a global phenomenon. But what are its long-term implications for cities? Can dockless systems help increase cycling demand and reduce congestion and pollution? Or will its downsides outweigh any gains for urban users? A closer look at these systems presents a mixed picture of what to expect. Dockless bike-sharing systems are expanding rapidly because they present many advantages to individual users. First, the registration process is relatively easy and quick, and once in the system, users can unlock bikes with a tap of their smartphones. They are also more flexible compared to station-based systems with a greater range of action, since their use is not limited to areas with docks, and there are no problems finding a docking spot at the end of a journey. Finally, user fees for single trips are generally cheaper than station-based systems. From a macro perspective, dockless systems are attractive for their potential to increase cycling demand in cities, which in turn can reduce mortality risks, improve health, reduce local air pollution, reduce noise and increase local business revenue. Dockless systems can also bring bike sharing to places where building new stations might be difficult, like historic zones. Moreover, their implementation requires less capital investment since they do not need new physical docking infrastructure. The main players in the market are backed by private venture capital, which makes dockless implementation quicker and cost-free for the city (at least direct costs), with the possibility for easy pilot projects. Finally, dockless systems produce a tremendous amount of data on people’s travel patterns, which could theoretically be used to aid city planning and policymaking. The rapid development of dockless systems has not come without thorns, however. Without designated docking stations, users can leave bikes anywhere, which can generate problems with the distribution of vehicles and the use of public space. 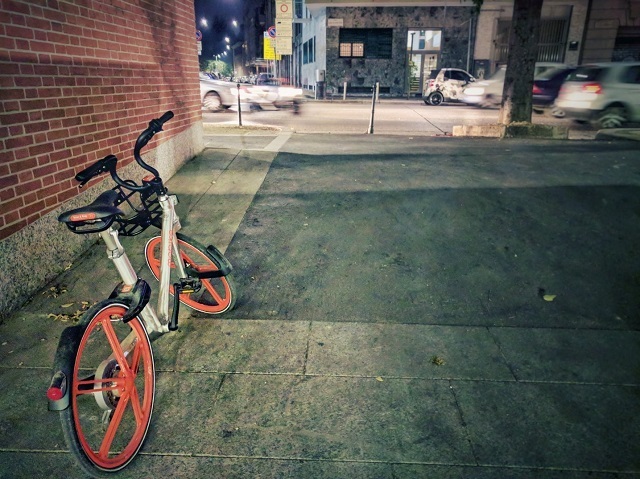 Generally, dockless private providers do not redistribute bikes within their area of operation, relying on users to move bikes around themselves. As a result, in some cities with many providers and users we’ve seen clogged sidewalks, piles of broken bicycles and even bikes parked along highways. Vandalism, improper use (e.g., parking bikes behind private fences where others can’t access), dumping and theft are other problems some cities have experienced. Moreover, despite the low price of shorter trips, dockless systems may not be as well suited for daily commuters as station-based systems, where generally the more the user rides, the cheaper the cost. Furthermore, the smaller user fees combined with exposure to vandalism and theft leave ample room for questioning the long-term financial sustainability of dockless providers. At the end of 2017, three dockless companies went bankrupt, and some see the market as a bubble ready to burst. Since providers generally do not have service contracts with cities, their abrupt demise or changing financial calculus could lead to service disruption for users. More importantly, to date, there has been little data sharing between dockless providers and municipal governments, leaving the potential to inform urban planning decisions largely unrealized. The boom of dockless systems is also changing the bicycle supply chain industry. Some manufacturers in China have already switched to producing shared rather than private-use bicycles, driving up the price of components with potentially profound implications for the bike industry and bike usage worldwide. Finally, the environmental impact of the mass manufacturing of so many bicycles with an average life span of two to four years has yet to be evaluated, and it’s unclear whether they can or will be recycled at the end of their lifetimes. Possible solutions to some of these challenges are nonetheless on the horizon. From data sharing to overcrowding, better collaboration between dockless providers and local governments could solve many of the problems integrating this new mobility option into urban transit networks. Some cities that want to have more control over dockless schemes, like Seattle, San Francisco, Paris, London, São Paulo, Florence and Milan, have already introduced new regulations to require regulated or designated parking areas, insurance for users, safety and maintenance standards, the capability to remove and redistribute the bicycles within the city, and the obligation to share specific data collected with local authorities to better inform city cycling strategies. Similar measures have been recommended by the European Cyclists’ Federation, and dockless planning guides for cities have started to emerge. It’s too early to draw informed conclusions on the effects dockless bike sharing is having on urban mobility. These new systems have the potential to become excellent first- and last-mile connectivity solutions for cities, linking transit hubs together and extending their range to reach more residents. But we need to see steps to reduce the waste seen in some cities and closer coordination between local governments and dockless companies to develop long-lasting regulations to operate safely, sustainably and civilly. Luca Lo Re is an Energy, Climate and Finance Associate at WRI Ross Center for Sustainable Cities. He works on the Financing Sustainable Cities Initiative, an initiative of WRI Ross Center and C40 Cities, funded by the Citi Foundation, helping cities develop business models that can accelerate the implementation of sustainable urban solutions.